In 1992, Esquire magazine featured a white-on-white cover that was a bizarre homage to the graphic design of the Beatles’ White Album. “White People: The Trouble with America” the cover read. When I received that issue, I wondered how long the editor would keep his job. The essays inside indicted some of the white people who were the trouble with America, including Charles Manson and the cabinet members of President George Herbert Walker Bush’s White House. The issue also offered a story by Robert Stone. The regular appearance in the magazine of writers of Stone’s caliber was the main reason I had subscribed—Barry Hannah, Peter Matthiessen, Edward Abbey, Thomas McGuane, and especially Jim Harrison. I could not afford to travel to Paris that year, but at least I could read about Harrison’s gustatory exploits in Paris. Harrison was an excellent surrogate, after all, since he had the soul of a poet and the appetites of six or seven people. Esquire was pugnacious then. It enjoyed boxing the ears of the status quo and jumping on the back of one zeitgeist or another. Another issue featured critiques by several feminists on what they thought about men, and the collective portrait of manhood was neither handsome nor reassuring. Esquire at that time was an odd vessel by which its publisher hoped to sell millions of dollars in advertising for luxury goods. The editor of the “White People” issue was Terry McDonnell, who would also put Spike Lee on the cover later that year. McDonnell’s tenure at Esquire would be brief. Strong editors of important magazines push at the boundaries of our culture as it reinvents itself, and sometimes the culture pushes back. A passive, inert dull magazine . . . is usually made up of editors who sit around and wait for writers to send them queries, or pictures, or finished pieces upon which they can react and then fulfill themselves. . . . Magazine editing is not just the act of choosing, it is an act of assertion. In the last century, changes in American culture created opportunities for print magazines to capitalize on those trends, and editors had to push their magazines to ride the crest of whatever promised to be next. New readers had new aspirations, and good editors and their writers and photographers revealed those aspirations in stories, profiles, and pictures. Advertisers would pay dearly for the chance to complement those tableaux with the best possible accessories. John H. Johnson established Ebony in 1945. Jann Wenner launched Rolling Stone in 1967. Warren Hinckle unleashed Ramparts upon the 1960s. Helen Gurley Brown revived Cosmopolitan in 1965. Anna Wintour seized her post at Vogue in 1988. Liz Tilberis resuscitated Harper’s Bazaar in 1992. And Terry McDonnell devoted a frenetic lifetime of surfing cultural currents for Outside, Rolling Stone, Esquire, Sports Illustrated, and several other magazines. The Accidental Life narrates his editorial assertions with some of our most famous literary movers and shakers: Hunter S. Thompson, Richard Price, James Salter, Kurt Vonnegut, Robert Ward, Elizabeth Gilbert, Richard Ford, George Plimpton, Frank Deford, Elaine Kaufman, and many others. 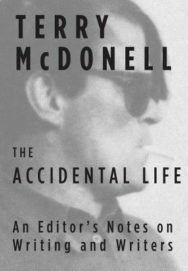 The Accidental Life is a quotable book populated by quotable people, and its account of the slow, ongoing demise of print magazines is an arresting subplot within the story of McDonnell’s career. Steve Jobs makes two appearances as a harbinger of the mortal wounds the digerati would soon inflict upon print media. During a visit to the MIT Media Lab, McDonnell was asked by a young engineer what he thought about algorithms becoming the new epic poems of journalism. McDonnell replied that Machiavelli would love that. McDonnell’s peers were no longer other editors, but code, the formulae of Google and other aggregating media apps, which select for their readers what they wish to see based on their “likes,” what websites they have visited, what is most popular on the web this week, and what purchases they have made online. Algorithms provide instantaneous market research and editorial taste-making for specific demographic groups. Soon enough I’d be spending more time with tech developers and executives than with writers. But the new work was fast and satisfying too, and I thought that what I saw coming could be very good for traditional publishers, a counterbalance, if we moved quickly. It was 2007 and magazines were already hemorrhaging readers, and advertisers weren’t making those multimillion dollar buys anymore, but change was always good if you could adapt. I made speeches about that at management meetings. It wasn’t until later that my job began to feel like an embed in a routed and retreating army. According to a report of the Pew Research Center, 61% of Millennial readers prefer to get their news about politics and government from Facebook, while 39% of Baby Boomers use Facebook for their news. The shift to news curated by algorithms is well underway, and with it, millions of dollars or ad revenues have fled magazines and newspapers for Facebook, Google, and other aggregators of content. “Creative disruption” is a euphemism for this change. For McDonnell and his peers, it is a Machiavellian coup with serial assassinations: LIFE, Mademoiselle, McCall’s, Gourmet, Teen, and even PC Magazine—rest in peace. The Sporting News and Newsweek would contract, quiver, and die to become ghosts of their former selves, as websites only. Most magazines now lead double lives, with free web-based articles undermining the newsstand sales and subscription sales of their issues in print. Why should you subscribe to a few print magazines when your mobile device can sample them all to your liking? Who needs editors and print’s slow production and distribution when algorithms and your smart phone can deliver what you want when you want it? Who needs a new print magazine for a new cultural movement when social media provides an outlet for that movement now and each formerly passive reader can embrace the thrill of working as a critic, activist, or confessional exhibitionist? Social media has blown apart the hierarchy of the magazine masthead and replaced it with a global 24/7 karaoke bar with billions of stages and video screens. The Accidental Life is full of wistful passages for the days of flush magazine budgets, when editors could send writers on extended assignments with unbridled expense accounts. Hunter S. Thompson could report from several mind-bending points of view, each of them his own, and each tempered by whatever drugs he had ingested at the time, with the fire of each deranged synapse facilitated by Rolling Stone. It’s possible that William T. Vollman was even more excessive, with the scars, enlarged liver, and STDs to prove it. According to McDonnell, Sports Illustrated once spent $1.5 million on tickets for sports events, and many of those tickets were perks for staff, contributors, and advertising clients. Those perks are far fewer now. McDonnell’s roster of contributing authors is mostly a white boys’ club because that’s what analog publishing was in his heyday. It remains that way today, mostly. Women such as Helen Gurley Brown, Elizabeth Hardwick, Liz Tilberis, Tina Brown, Natalie Nougayréde, and Pamela Paul would become gatekeepers too, eventually, but few women reach the top of the masthead. In a chapter on women’s magazines, McDonnell notes that one man, Jack Mack Carter, was the editor of three magazines for women: Ladies Home Journal, McCall’s, and Good Housekeeping. The legacy of white homogeneity in publishing made magazines vulnerable in the digital age because niche markets became more numerous and powerful. Glossy magazines, in most cases, lacked the will, the personnel, and the business model to serve the new demographics well. Driven by their ad revenues, glossy magazines had devoted themselves to the biggest possible markets of people with the highest amounts of disposable income: white women 18 to 49 years old, or white men 18 to 49 years old. The markets for media are now stratified and segmented by gender, age, region, race, education, income, cultural interests, political affiliations, buying histories, and sexual orientation. Websites and social media can cater to each growing group in a way that LIFE, McCall’s, and Newsweek never did. Many readers did not recognize themselves in the white bread world of slick magazines. The articles, the photos, and the ads did not portray their lives. But in social media, previously invisible and misrepresented communities could express themselves and see themselves—an exhilarating break from the past. Social media changed the balance of power regarding who speaks for whom. Glossy magazines, meanwhile, still hunger for a broader and bigger category of readers—a mainstream—that no longer exists. A terrible characteristic of glossy magazines is that their content is shaped by their advertising and profit margins, but a wonderful characteristic of glossy magazines was that ad revenues afforded the ability to pay contributors a living wage and to reimburse writers for their research and adventures—investigations and travel that would provide the foundation for future books and royalties. Google, Facebook, and other aggregators have diverted billions of dollars away from local newspapers and national magazines. The redirection of those billions has diminished or terminated the paydays of journalists, writers, photographers, illustrators, and designers. Amid this change, the fate of investigative reporting is especially worrisome. The Washington Post did an analysis of the 1,271 government organizations and 1,931 private companies, all of which conduct counterterrorism and domestic surveillance at 10,000 locations in the U.S. It takes years of diligence, a big team of professional journalists, and a lot of money to deliver such a high level of comprehensive reporting. Who will do that kind of reporting if the Post can no longer afford it? This is not the kind of news that can be crowd-sourced by the citizen-journalists of Twitter or by WikiLeaks. It is not the kind of project Google or Facebook would fund on their town-sized campuses. And what if your school board or local judges are possibly corrupt? Your local newspaper is probably too understaffed to investigate. Monster.com, LinkedIn, Craigslist, and eBay have decimated the income from your local paper’s classified ads, which once made big newsrooms possible.
. . . word rates have dropped at established magazine like rocks in draining ponds. Paying three and four dollars a word was no problem for me at Rolling Stone and Esquire, and there were many writers at Condé Nast magazines getting five dollars. Twenty years later, a dollar a word makes writers almost happy, in light of what they get from even a thriving website like the Huffington Post. The World Wide Web demands that the democratization of journalism must be its own reward. Writers and editors of the Baby Boom face the digital culture, and they see a terrible beauty is born. Print magazines provided a lot of social capital as well as the paychecks for good work. Good social capital makes its community wealthier in help, safety, commerce, and care. McDonnell’s stories about going to dinner with Kurt Vonnegut or playing golf on acid with Hunter S. Thompson reflect how lively those old social networks could be. There are many indications that the new virtual networks provide, at least, social capital for younger writers. The weakening of old-boy networks removes impediments for the advancing careers of young writers, but, meanwhile, Google and Facebook hoover up all the cash. Can jobs in academia and Hollywood replace the economic base and social capital that our most talented writers once gained from their work for print magazines? Will the welter of the web someday do its own fact-checking, cultivate the better angels among our (sometimes very flawed) writers, show us their best work, and spare us their worst? Can the democratization and algorithms of the web preserve the virtues in discernment of print culture but spare us the old prejudices and failures? A new generation of writers, publishers, and readers will answer these questions, of course. In the meanwhile, The Accidental Life provides a vivid panorama of one literary society deposed by another. Between the vagaries of Hollywood and academia, print magazines once provided a hub for writers to find jobs, solvency, and fellow spirits. In working with smart magazine editors, good writers became better writers. Their short stories, novels, and essay collections would be better for the collaborative work. Among the old guard, nostalgia for Elaine’s restaurant and the salad days of the Paris Review is an understandable vice. People like George Plimpton, Elaine Kaufman, McDonnell, and other editors comprised a network that administered love, money, and connections for writers. McDonnell’s accounts of these ministrations among great talents and their Jupiter-sized egos make this book worth more than the price of admission. The book dramatizes the making of a fine magazine as a team sport—an activity that requires ambition, stamina, expertise, heroics, camaraderie, intimacy, and awareness of our changing politics and culture. I thought about what Ward had written about Lee Marvin and his father beating him and what had come out of that. Ward’s new piece was a short story called “Scouts,” about working-class fathers and sons falling away from each other: Troop 99 in Baltimore was in a bad part of town—and very different from what you’d find in the official handbook. The pain in that sentence was ominous. The best writers all know how to do that. You didn’t edit it into their pieces any more than you edited their sensibilities. What you did was ask for more detail. By such intimate ministrations of respect and discernment were the great magazines made. This entry was posted in Uncategorized and tagged Fall 2016 on November 11, 2016 by Kelly.